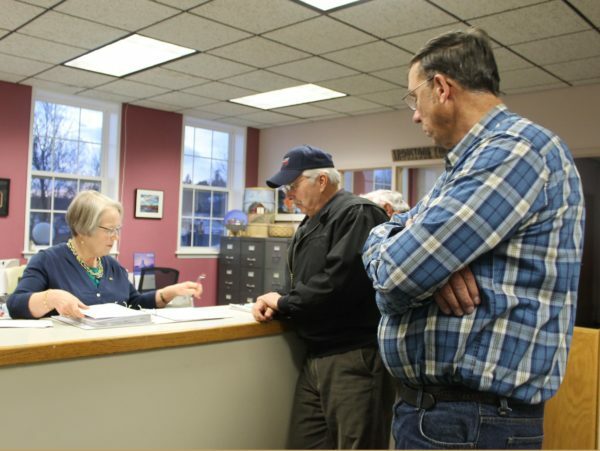 Caribou Secession Committee Spokesperson Paul Camping (center) and major petition circulator Milo Haney watch carefully as Caribou City Clerk Jayne Farrin reviews submitted petitions seeking secession submitted in March 2015. CARIBOU, Maine — A legislative panel voted 12-0 Monday against a bill that would have authorized, pending a referendum vote, the secession of a large geographic area from the city of Caribou, according to Caribou Mayor Gary Aiken. The unanimous “ought not to pass” vote by the Legislature’s State and Local Government Committee effectively kills the bill, LD 830, which was introduced on behalf of a group that began efforts more than two years ago to secede from Caribou and create a new town of Lyndon. The secession idea was first presented to the Caribou City Council in the summer of 2014 by a group of residents upset with what they perceived as an unfair tax burden placed on rural property owners to support a bloated municipal budget. In March 2015, members of the secession committee submitted a petition with more than 1,300 signatures to the town seeking to leave Caribou and take 80 percent of its landmass with them. If passed, the bill would have given Caribou residents who live in the proposed Lyndon territory the choice to vote on seceding from the city and incorporating as Lyndon, a new community with a town meeting form of government. Caribou operates with a city council and city manager form of government, that secessionists have said doesn’t give them enough say in how the community is run. Mayor Aiken said shortly after the vote that the only way the secession committee could move forward is to start all over again. “They would have to start a new petition, meet with council, and have another public hearing. That whole process has to be redone again,” “Aiken said. Two bills for secession within Gray, Maine — LD 618 and LD 619, which would respectively authorize the Mount Hunger and West Side of Little Sebago Lake areas of the town to secede — also were rejected by 10-2 votes, according to Aiken.